Our city's elected leaders claim that they want to bring good jobs to Elk Grove, but, like jobs, work is a four-letter-word with many meanings. From great work to the worst, it can be fulfilling or enslaving. The same work can bring happiness to some and nothing but grief to others. Is this due to personal attitude, or is work inherently good or evil, or something in-between? Are some of us lucky to have a completely positive experience with work? Are some of us doomed to having bad jobs and bad bosses? Most of us look at work as something that has to be done, and that we usually get paid for it. Afterwards, we go home and perform work which is uncompensated, except to ready us for yet another day of work. Doing the laundry, preparing meals, cleaning the house, raising our kids, picking up dog poo; the list is long and growing because our lives have become technically complex, and that's because our outside work has invaded our private space. Those of us who are gainfully employed are lucky to have full-time, benefited positions. Many are not and have joined what analysts have called the precariat, those who work is conditioned upon the employers' needs. Such needs are characterized as in-time assignments and part-time only work. In-time inventory is the precursor to in-time assignments. Big box retailers have been known to use the railroads as rolling stock so as to avoid payment of inventory taxes and to deliver goods as they're depleted from store shelves. In-time assignments work the same way: you're called in to work, but sent home early because the employer declares that you're not needed. Part-time only employment eliminates the requirement that the boss pay health and other fringe benefits to workers. This sort of work is precarious employment for the worker, because they cannot afford to get sick or have a car break down on the way to work. Even in the best and most modern workplaces, the factory is fraught with danger. Safety is a malleable objective as the production process can change quickly and often. Safety rules can and are broken in the name of increasing speed on the line; it works until someone is hurt or killed. I have personal factory experience where I've come very close to becoming victim or murderer; in the factory, these roles can become inseparably defined. Although some factories have no windows, many white collar offices are windowless. If sunshine is the universal disinfectant, then this might explain how and why work can become infectiously oppressive to human beings. But other, stronger inhibitions at the workplace determine our behavior and how we feel about work. I believe that these prohibitions constitute lack of opportunity: to exercise; to rest; to think; to create; to imagine; to control our own environment; to find meaning; to be moral and ethical; to be happy; to meet our needs; to learn. In many ways, our workplaces are prisons and our work is doing the imprisoning. How are we imprisoned by our work? A friend once told me that the only thing worse than a terrible job with a horrible boss, is NOT having a terrible job with a horrible boss. Unemployment is the feared threat and reason why heart disease, obesity, and GERD prevail in our society. Workers are perpetually and chronically threatened with job loss should they fail to cow-tow to their bosses. A few, very loud critics of this fact try to shout down its existence, but without any convincing evidence. Instead, public health data point to a booming pharmaceutical business in insulin products, statins, and proton-pump inhibitors to treat these dominant diseases of our culture. Briefly, work is toxic to human beings when we cannot control it, and when it controls us. Tools are human inventions which have turned on us because we've allowed them to do so. 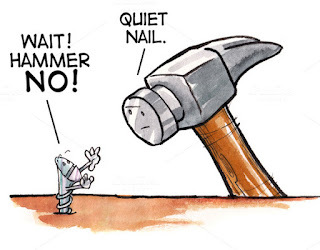 The hammer can drive the nail to the wood we intend to fasten. Or, the same hammer can be placed in our hands by the boss whose intention we're compelled to obey. One is satisfying; the other, imprisoning. A vote for Sanders or Clinton is a vote to not have to work! Go Handouts! Only mediocre quality subdivisions being built. Too many strip malls, fast food joints, etc. No culture; arts, music, theater. No business parks designed to attract start up and emerging stage technology companies. Too much sprawl and no character. As usual, Warren Buffett, you are out of touch with reality. One reason why the service industry flourishes here is because cleaning a house, raising a child, lawn work and tending a small garden have not yet been automated; another reason is because there is a very large, captive immigrant population of reserved army of labor to do those things for very little pay; or, sometimes, for nothing. Clinton and her hubby changed welfare as we knew it. In fact, welfare reform modified the handout to welfare-to-work. Many adults have been cut off welfare due to inability to find much work at all; the "handouts" have ended, effective 1996. Sanders wants the welfare enjoyed by large corporations and banks to end, so that there's enough taxpayer money to pay for education, child care, single-payor health benefits, and public amenities like clean water, parks, schools, and community centers that benefit all the people. It's the opportunity cost, Warren, that's lost to fighting foreign wars, guaranteeing insane profits for the biggest players in capital, and keeping you rich. We could have had a rich and compassionate community...NOT. Go to Detroit's upscale neighbor, Grosse Pointe, Michigan, Warren, and pull into a "public" park. You'll be turned away by private security if you don't have a pass. That's the kind of world real people live in, and the sort you celebrate. The irony is that you, Warren Buffett, are the biggest welfare whore of all. Berkshire Hathaway owns so many socially unjust businesses that benefit from gargantuan public subsidies, while forcing some of their employees to beg at local community food lockers. You have become obscenely rich on the backs of workers. Shame on you, Warren Buffett. No, Mr. Buffett; the Clintons put an end to "handouts" with welfare reform in 1996. Most all handouts go to the likes of you, Mr. Buffett, what with subsidies for food at your Kraft/Heinz acquisition, your employees at Dairy Queen who must await monthly allotments at the food bank, and all the benefits our taxes give to you and your insurance and finance companies subsequent to the 17 trillion dollar bailout just a few short years ago. In my twenty-three years of work in welfare social services, I have never encountered any welfare recipient across my desk as corrupt as you; and you appear to be the beneficent grandfather of the bunch. Bernie Sanders doesn't want banks and corporations to receive welfare anymore. Foreign wars, corporate profits, and bank bailouts are the priorities of the existing capitalist program. Sanders wants our communities of people to have resources for schools, clean water, community centers, access to health care, and the chance to survive. Non-persons, like your companies, seem to have all the breaks. No, Mr. Buffett, you and your companies are the biggest welfare whores of all history. You'll create non-profits to disperse a very small fraction of your wealth, but don't pay your fair share of taxes. Thanks for the article, Mike, nice depiction of life as it is, for more and more of us. It's not new, by the way, just more widespread. I read a novel set in the 30s, when there were railroads and people had phones, or at least one in the hallway in their boardinghouse. I think it was the switchmen and jobs like that, who were called in as needed. Had to have a phone and stick by it in case there was a call. And later, in the 50s and beyond, substitute teachers worked the same way; they'd get a call in the morning, in some time window -- or not, but they had to be there, by the phone. Now that it is computerized, subs have an easier time of telling whether they will be needed, and they can take themselves off the list for days they don't want to be called. Um... As long as they have computers. I'm not sure there's a way to be a sub without having a computer. Also, good answers to Warren.